What brings together the mayor of Miami, a couple of the city’s hottest chefs, local farmers, Haitian refugees, tatted hipsters, inner-city residents, and guys in suits? Jewel-like heirloom tomatoes. And fresh, locally grown collards, carrots, eggplants, green beans, loquats, and more. It’s all happening at Roots in the City, Miami’s newest farmers' market and a magical convergence of cultures. I’m skeptical about magic. I’d like to have faith in the universe’s benevolence and all that, but usually I find we’ve got to help it along. Roots in the City has had some serious magical muscle behind it, including the folks at Miami-Dade’s Human Services Coalition; local CSA maven Michael Schwartz, the chef of Michael’s Genuine Food and Drink and a recent James Beard Award winner; and Michel Nischan, a chef and the author of Sustainably Delicious. Nischan is another Beard winner, as well as the founder of Wholesome Wave, a nonprofit working to make fresh food accessible to everyone. 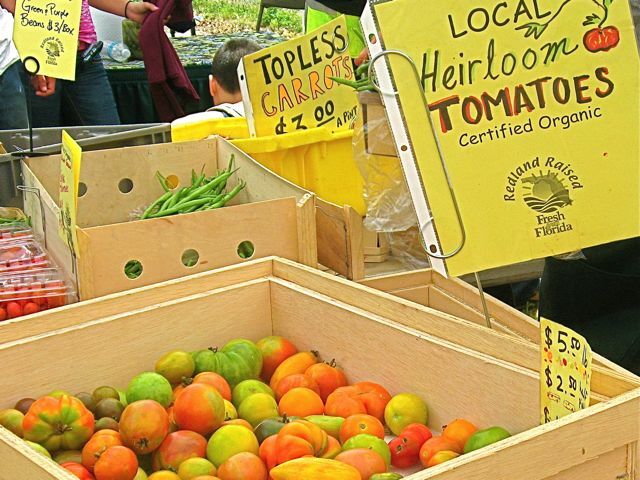 Wholesome Wave has sponsored more than 100 farmers' markets in a dozen states, the latest being right here. Roots in the City not only brings fresh produce to an underserved part of Miami, it offers double value on food stamps. A dollar’s worth of food stamps gets you two dollars’ worth of veggies, and local residents like Sarah have been going for it. He means people living in so-called food deserts, where the neighborhood stores are liquor stores and convenience stores, none of which sell anything fresh. He means places like where Sarah lives. When Roots in the City opened, Sarah didn’t have to take a bus or three across town to find fresh food; she just had to leave her apartment and cross the street. She was the first person at the market, buying up bags of vegetables, hugging Nischan, sampling some of Schwartz’s braised collards, and politely listening as the mayor gave her an earful about how important Roots in the City is. Like she doesn’t know. Still, she posed next to him for a photo op, her arms full of fresh collard greens, carrots, and tomatoes. This is the Miami I’ve always hoped for, one we can all call home, a place where we come together, whoever we are. Because we all gotta eat. And whoever we are, we all deserve to eat well.